Taken from another manuscript of a Book of Hours, in the Office of the Dead, this particular folio includes lessons for Matins, from the Book of Job (in particular his 8th lesson). The script is relatively uniform Gothic, with a variety of punctuation & numerals used throughout to indicate distinctive sections. While not as prominent as the other exhibit pieces, examples of marginalia in this folio is that which is extending out of the letter P, on the bottom of the verso. The decorative letter presents an intricate floral design of blue and gold colours, with a single striking green leaf. There are few markings indicating previous ownership or origin, barring the tape damage from handling and/or display at one point in its past. The original seller had purchased it in Lyons, and identified it as being "unmistakably French in origin", likely in the 13th-14th century. 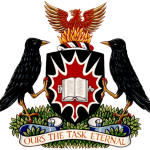 The deep black ink, along with the fine translucent nature of the parchment, hints at a higher quality work that was unfortunately not well cared for, yet survives to be enjoyed & studied by future Carleton University generations. tente timor mortis conturbat me. persequmini me sicut deus et. 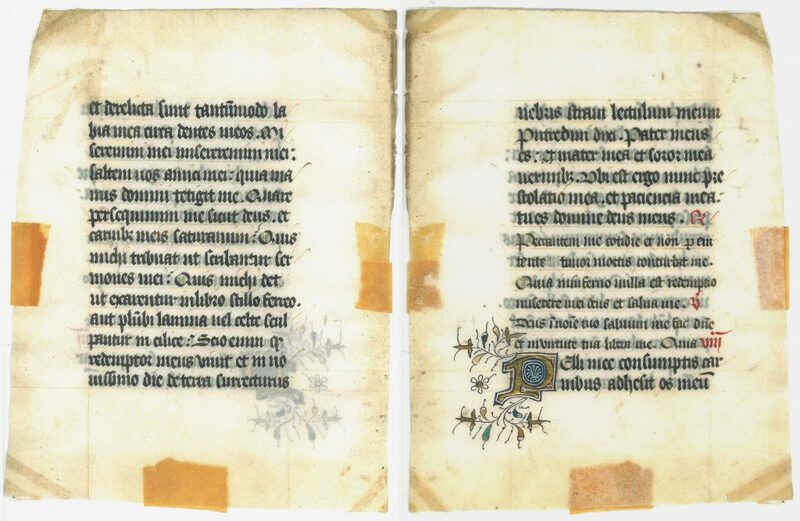 Title: "Book of Hours: Lessons from Job"
Ruling: Recto text 70 mm x 90 mm; Verso text 65 mm x 90 mm; 12 lines of thinner text, 6 lines of bolded text (recto), 14 lines of bolded text (verso); Some faint evidence of line tracing. Illuminations: A single decorative letter, a capital 'P', starting off the 8th lesson of Job, occupies the space of two lines; the only example of marginalia is extending out of the decorative P. The marginalia and the decorative letter consist of blue, gold and a single green leaf.